My Siamese 'gifts' - pure heaven! I was alone, and feeling sad and suffering from depression. Then out of the blue I was given the chance to adopt my two Siamese girls, Millie and Mojo. A seal point and a lilac point ... and how they have melted my heart and changed my feeling, not just about myself but about others! Whoever says cats are bad must have a bad soul. Siamese cats are sent to care for us just as much as we care for them. For the cost of a little food, a warm home and a little love from me they give so much back. It makes me smile a great deal - something I have not done in a long time. Millie is four and Mojo is two. They have been sent to me for a reason - so many many happy years to come. Thank you so much for your story, Anthony, and for telling us about Millie and Mojo. I agree that Siamese cats are able to lift the saddest of hearts with their games and antics! I was just thinking earlier today how much our own cat has completely changed our lives. 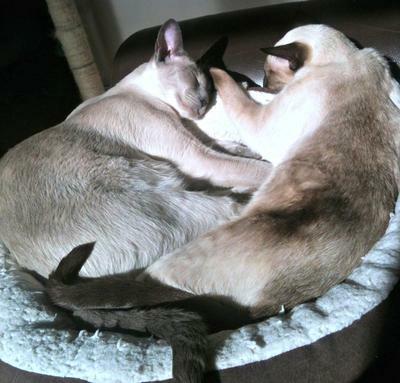 How lovely that you have two Siamese cats - they do enjoy company and Millie and Mojo look so comfortable snuggled up next to each other in your photo. I hope, too, that they'll be with you and lifting your spirits for a long, long time to come! Comments for My Siamese 'gifts' - pure heaven! I had to put my beloved cat to sleep a few months ago. I miss her so much. Now I have been given an opportunity to adopt two Siamese girls. One is five years old and the other is one year old. I use to own two Siamese years ago so I am more than excited about having these babies. I also have depression and I know how much love and comfort, smiles and joy they will bring me. Having a cat keeps me focused on all the things I want to be. Gentle, elegant, meditative, thinking before acting, moving with non resistance to this world but at the same time using precaution to take care ... and of course the masters of peaceful sleep. My life is about to be everything that means HOME. Thanks for sharing such a lovely story. I suffer from depression too but my little seal-point Siamese cheers me up enormously. Millie & Mojo are such beauties, congratulations Anthony. Yes Siamese (and Orientals) are such loving goofy little angels. Enjoy the many many hours of love and entertainment they will provide.